Over the years, I have worked on mastering the art of biscuit making. So my husband and my best friend are always delighted when they hear that I am including biscuits with dinner. Of central importance to great biscuit making are using cold ingredients and taking care not to overwork the dough to ensure that they rise, with a delightfully crisp exterior and flaky soft inside that is moist with an almost melt-in-your-mouth quality. As satisfied as I am with my current staple biscuit recipes, I'm always interested to discover new ideas — especially if they come from such an esteemed chef as Raghavan Iyer . Adding cooked potatoes to biscuit dough is new to me, but while the flavor of the potato in the biscuit is quite subdued, its earthy and buttery presence makes itself known, especially when it comes to the soft and creamy element it adds to the texture of the biscuits. The habanero chili really works here, combined with hints of oregano. Don't let the idea of habanero heat scare you away — only one is included into the mix so that it adds a pleasant warming quality from head to toe. That little bit of heat, along with all of the other elements of the biscuits, makes these a perfect accompaniment to any meal calling out for the comforting goodness of freshly baked biscuits. I like to enjoy these with a good pad of butter, especially when they are served warm right from the oven. 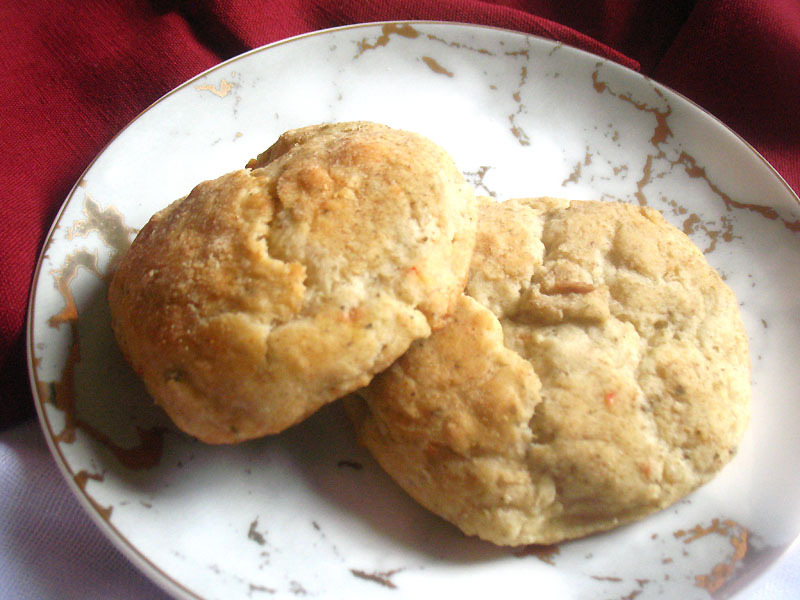 You can easily reheat any leftover biscuits the next day. Wrap them in foil and gently warm in the oven. Peel the potato and cut into bite- size pieces. 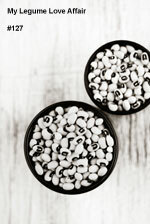 Transfer to a medium saucepan, cover with cold water, and bring to a boil over medium-high heat. 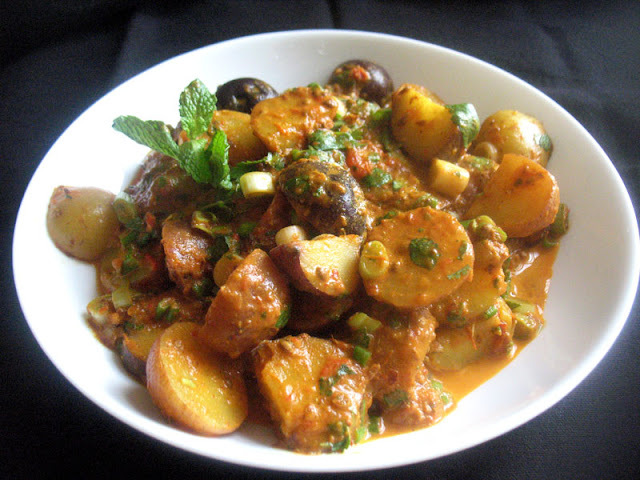 Reduce the heat to medium and simmer, partially covered, until the potatoes are tender, about 12 minutes. Turn the heat off, pour the cooked potato into a strainer, and transfer back to the same pan. Stir for about a minute to dry the potatoes out. If you have a ricer, press the potato onto a small baking sheet lined with parchment paper. Alternately, mash the potato and fluff with a fork and spread onto a baking sheet lined with parchment paper. Place the baking sheet into the freezer briefly to chill. In a large bowl, mix together the flour, baking powder, sugar, oregano and salt until well combined. Add the butter and using a pastry cutter or a fork and knife, cut the butter into the mixture until the butter is broken down into small pieces and the mixture has a consistency of coarse crumbs. Stir in the habanero and chilled potato pieces. Stir in the cream or yogurt and mix everything until it just comes together to form a wet dough. Take care not to over mix. Cover the bowl with plastic wrap and chill in the refrigerator for 30 to 60 minutes or longer until ready to bake. Line a baking sheet with parchment paper. Preheat an oven to 375°. Flour a large board or parchment paper lined surface. Dust your hands with flour and turn the dough onto the floured surface. Gently knead a few times, and shape into a rough rectangular shape. Fold it over twice onto itself and press down until the dough is about 1-inch thick. Add more flour as necessary, taking care not to overwork the dough. You want the biscuits to be moist but not too sticky. Shape the dough into biscuits that are roughly 2-inches in diameter and 1-inch thick. Transfer to the prepared baking sheet, leaving at least an inch between the biscuits to allow for rising. 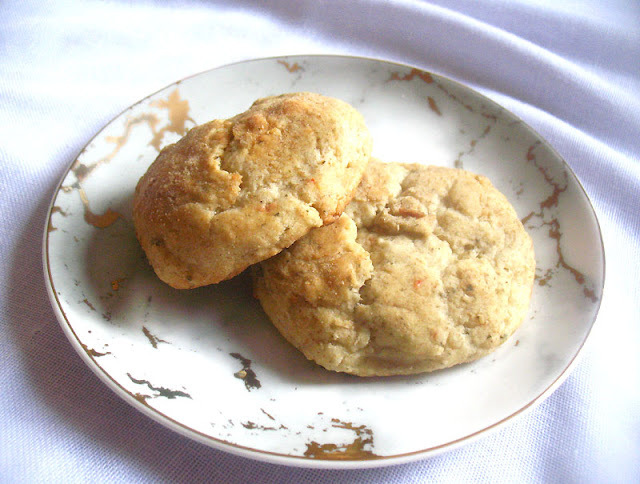 Bake for 25 to 30 minutes or until the tops of the biscuits are golden brown. Rotate the pan once during the baking time. Transfer the baked biscuits to a cooling rack for 5 minutes and serve hot.